Paradise awaits you when you step foot into this METICULOUSLY maintained home that shows it is loved. 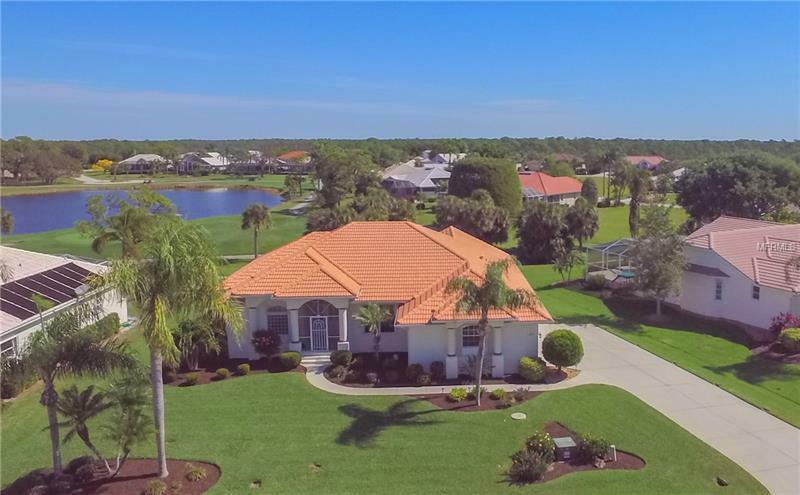 Double front door leading you to the spacious great room floor plan with expansive views of the pool and golf course/lake views. Nice size dining room for all your guests to enjoy their time at your new home. Kitchen has plenty of cabinets and counter space for 2 chefs at one time. Stainless steel appliances include wall oven, convection microwave, stove top, dishwasher and French style refrigerator. All bedrooms are oversized and have high vaulted ceilings. Bedroom 3 is currently set up as a den with built in desk and bookshelves but could be turned back into closet space. Master bedroom is large and offers an ensuite that will not disappoint with double sinks, nice soaking tub and large shower. Most of the rooms in this home have a fantastic view. Open up all the pocket sliding glass doors and you will see why you should be living here. Pavered pool deck with outdoor shower and plenty of space for entertaining all your new neighbors and friends. Sit back with your drink of choice and watch the golfers putt in at the 4th hole of The Links Golf Course. Why not live somewhere that you don't need a vacation from?